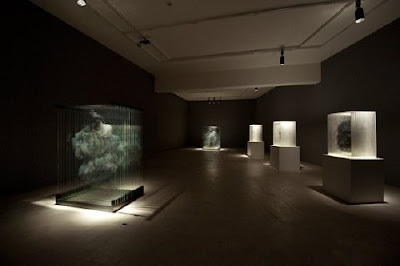 Perusing the latest issue of Hi*Fructose art publication, I became enthralled with the dimensional art of Xia Xiao Wan. 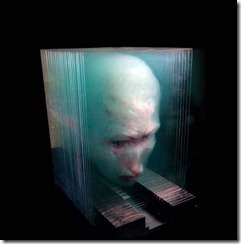 The artist paints layers of his images on successive panes of glass which are displayed spaced out slightly to give a more dimensional effect, like a series of MRI slices. I already have a great affection for glass, but these images seem so fragile and in some way more impactful and urgent than a crust of dried oil on a single flat surface. Most of his images seem dark and some are disturbing in nature, but all are amazing. Praline just loves her kennel cab. When I take just ridiculously too long to come to bed, she'll retreat to her personal bandit-girlie space. She's so cute, and she's much sweeter than the little hooligan mask could ever belie. Why does Blogger not let me have paragraphs any more? I like paragraphs. Are paragraphs going out of style? Last night my little girl got stung or bitten by something, most likely a bee or a wasp and her little snout got pretty puffy and lumpy. She's such a little Tomboy that it's startling how cuddly and needy she can be if she feels a little poorly. She couldn't wait to get into bed and snuggle. I laid awake for a while listening to her breathing, my hand on her little ribcage. She did not seem to be in terrible discomfort, and the puffiness went away. I'm so glad there wasn't an emergency trip to the vet last night. She forgets that intrepid souls sometimes get ouchies. Bless her little heart. Since my musical concluded, I've been going to yoga class religiously. I schlep into town and do my thingy there. The class is nice and quiet. The teacher seems a placid soul and the atmosphere is calming. I love the way my upper back pops when I do a forward bend. Generally, I think of this class as part and parcel of my well-being as I navigate the choppy waters of school and work. Before class Wednesday night, a handful of women were talking about the fact that the teacher is leaving, moving away, and the studio will close upon her departure. I felt saddened by the news. I've been going to yoga very regularly and am seeing a marked improvement on my posture, how I feel and my general outlook, but for the studio to close would mean a personal setback, I thought. On Wednesdays, a guitarist comes in and plays music-- usually Villa-Lobos and the like-- to the class as we pose. Wednesday night, though, I could never seem to banish monkey-mind. Thoughts were swirling about what I would do, now that I'm finally on track with a fitness/wellness routine, now that beloved yoga instructor is folding up her mat and running off to infinitely more attractive San Francisco. I'll miss her. What'll I do? Then the guitarist did the most unlikely thing: he played Saudade from Love & Rockets' debut album. I was in some supine pretzelian distortion and I fancied I heard something familiar. I heard the first few tones and doubted my senses. Could this be? Is he playing one of my favorite guitar tracks? No! Surely not! I remembered hearing that this band was releasing an album and going to the record store to pre-order a copy, and they called me when it arrived, about 1985. Love & Rockets. Saudade. When Metamorphosis records called and told me my record had arrived, I shot off like a bullet to collect my prize. Back home, I reverently peeled the cellophane from the (vinyl!) album's dustjacket and slid the disk onto my cheap record player to give it its maiden listen. Such placid joy sprang forth. Hearing Saudade in the class Wednesday so hot on the heels of news of such great impediment to my tranquility, I knew nonetheless all would be well, all would sort itself out. Things don't always work themselves out in a way that we would most prefer, but one way or another, they do work out. I don't have the distance to sense the order to this elaborate, brocade wallpaper, but I know there is some order at work there, and this is a comfort. Here's to keeping soft knees and going with the flow. All is well. Random post about my parents. I'm thankful for a great many things. I'm thankful I live in a place where I-- as a rapidly-hurtling-into-middle-age woman-- can go to college with the prospect of starting a whole new career where I may thrive and make enough money to put by for myself in old age. I'm thankful for my dear little dogs who make each day an absolute joy. Any day I wake up with them and go to sleep with them was a good day. Any night when I rouse to find one glued to each side was a night of warmth and contentment. They are my babies and for them I am truly thankful. And finally and most importantly, I'm thankful for parents who are so remarkable and brilliant, and yet have always taken the time to tell me how special I am, and that nothing to which I aspire is beyond my grasp. I do hope to have as much belief in myself as do my Mom and Dad. Thus were born the seeds of any confidence I might ever have in life. May every girl born from here forward know the same. 98 F bloody degrees on April 25?? And last week an army of caterpillars ate much of the fruits of my labors on potted plants. I think my first nursing assignment is going to be somewheres else. Less of a stretch than you might think. This is my summation on Old NFO at the NRA Convention: Three guys are standing on the balcony at the Vatican, the middle one in some sort of white dress thingy. One guy down in the plaza says "who are those guys?" and another man replies "I don't know who the guy in the middle is, but on his left is Red Adair and that guy on his right is Old NFO." I haven't even given you the big wrap-up on the NRA convention, but finals are coming up quickly and I have a tremendous amount of material to cover with my studies. I'll be back on track soon. Mani Monday: nails that shine like justice. Or some such. A couple I know-- dear friends-- have a little boy who fractured his skull this weekend. Relatively speaking, his injury is not remotely as bad as it might have been, but just the same, it's scary to have a little one injured and hurting. He's in the hospital at least through tomorrow, and my thoughts are with the whole family right now. Here the pups are helping me study my Psychology material for school. Actually, it's remarkable what a soporific effect they have on me, but if I sit in the recliner with a book, they absolutely insist on cozying up to me. That's alright with me, too. I intensely dislike Blogger's new interface. Still busy as a one-armed paper hanger. Will soon return you to your regularly scheduled blogging. Meantime, here's a cute video from Kimbra. I love her style and I love those turquoise shoes. Yummy! One very interesting lady I met at the NRA Convention was Australian journalist Jodie Newell. She said the Australian public take a keen interest in watching politics in the USA, and I said maybe we're their soap opera. Jodie said she was surprised how low-key Romney seemed to be in his speech on Friday, having expected that he'd want to take the opportunity to curry favor with the 6 million voters who are members of the NRA. I think perhaps Romney does want the votes of the NRA members, but that he seems more eager for the votes of people who voted for Obama the first time and are now disillusioned, and that strong support for the NRA might turn those voters off. Speaking of good-natured, I just love the natural charm and grace of Herman Cain. Considering the vitriolic degree of the smear campaign he endured while his hat was still in the ring for the presidency, I'd say he sounds very upbeat and unscathed. The dignity of Herman Cain sounds downright Presidential, to me. A less mature person would have stamped off in a huff to take his marbles home and dissociate with the process. Clearly, however, he wants conservatism to triumph in the coming election, and contents himself with acting in whatever capacity he may to facilitate that victory. Listening to him, I feel my outlook has been far too negative, and I like being challenged in a way that makes me feel things have the possibility of improving. It's nice to hear his positive outlook, and it was also nice to speak to a journalist who seems to have a good natured affection for her subject. I came away from our chat with the distinct impression that Jodie Newell wants the USA to be strong and to thrive. Perhaps this is borne of the intrepid spirit of rugged individualism I like to think so many Americans share with Aussies. Thank you for passing this along, Ms. Newell, and all best to you! I have much, much much to share about the NRA Convention in St Louis. I met some fascinating people, found at least a couple of my future firearms purchases, and I learned a tremendous amount of things ranging from the political to shooting equipment and technique. I'm looking forward to sharing more with you, but I have a test in Anatomy & Physiology in the morning so I need to settle in with a book and some puppies. I promise to write soon in detail(probably by this time tomorrow), and I have some wonderful links to the blogs of people I've met to share with you. For all my friends and on-line blogroll folks who were in attendance, it was nice to see you again or to meet you for the first time(more on that soon, too, I promise!). I think ours is one of the most remarkable groups of people within our society. We are diverse, respectful and generally very upbeat people, and all this in spite of the politically correct finger-wagging that comes our way about the danger of guns and of people who own them. I chose a lovely Irish pub at which to convene for dinner on Saturday night, and we numbered around 20. The waitstaff at Tigín made particular mention that they always had a large influx of folks from every convention and seminar that comes to town, and they said we were by far the most orderly, respectful and pleasing group to have as customers. Lest you think the waitstaff were simply angling for tips, we were also told by janitorial staff at the convention center that we were so much neater and so much less rude than other groups. I think there is more than a little truth to Heinlein's saying that an armed society is a polite society. Bit by bit, folks are breaking off from the pack and heading home. Out of here by 5AM tomorrow. Will do a longer post when I'm home tomorrow night. General squeeing and jubilations abound. At Tigins Irish pub in St Louis. I'm awaiting my Irish breakfast with black pudding and Himself is awaiting his shepherd's pie. Life is good!!! The Benelli exhibit stoked my wish for one of their shotguns all the more hotly. Yummy. Henry has a .45 rifle that is exceedingly weighty but looks a real treat. Yeah, want one of those, too. It's a handsome thing. I've been planning to switch out my carry pistol for one that is smaller and especially lighter. Old NFO gave Himself and me a high-spots trot around the hall first thing out of the chute this morning, and he showed us a wonderful new pistol from Smith & Wesson called New M&P Shield. Do. Want. There's a dream of a trigger on that one. I can't recommend strongly enough that every shooting enthusiast make it to at least one NRA Convention. I definitely plan to attend next year in Houston. Even the generally very introverted Himself has enjoyed himself despite the crush of the crowds. You may fall in love with a new (or old) firearm, or you may simply find endless oodles of things to enhance your shooting experience. Most importantly, you'll meet a lot of really great people. Rock Island Auction Company's display here at the NRA Convention is nothing short of breath-taking. Here's a dishy row of nice butts of vintage rifles being auctioned soon, and the low-end of the estimates on these range from $4000 to $150,000 on the low end. The hardware on these is spectacular. I should have brought a drool cup. The scale of this show is difficult to convey, but it's absolutely massive, and the booths are impressive, to say the least. I've found at least 2 of my near-future firearm acquisitions. Bought a nice Blackthorn cane for my brother and one for Himself from Cold Steel. The drive from Texas was absolutely gorgeous. Himself and Matt G had never been to Missouri or the Ozarks, so even though I'm from the Arkie part of the Ozarks, I was very proud to show them some lovely scenery from that beautiful region. We left sufficiently early that we made nearly the entirety of the 11ish hour drive in daylight. The weather was on/off rainy but mostly it was just cloudy and I enjoyed the dulcet tones of my iPod shuffle which seemed to feature most heavily selections from Elbow, Frightened Rabbit, Berliner Philharmonic and Feist, punctuated by the occasional gentle snoring of One Vanilla Gorilla in the back seat. Arrived in St Louis as it was becoming dark, and we were greeted at the Millennium Hotel by dear friends, some old and some new. We stayed up too late, but it's hard to retire from such dear and rare company. The photo (if it ever finishes loading) is taken from the hotel room and overlooks the Mississippi. I'm all agog and about to go into the exhibit hall and I'll check back in with you later. Have a great day! Himself and I are leaving this morning for St Louis to attend the NRA Convention. Sadly, the puppies will not be able to attend with us, and I'm heartsick that we'll be parted for 5 days, but hopefully I'll have lots of wonderful things to tell you about and great photos to share with you. Someone told me the St Louis media reported that 60,000 people had registered for the convention. Holy mackerel! Very exciting. I look forward to bringing you lots of good news. 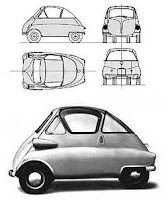 I'm pretty sure this is an Isetta in someone's car/appliance graveyard/mosquito factory in the country near my town. I had a terrible customer service experience Monday night and it really steamed me. I won't say the name of the business (monster-huge, you have one in your town), but the surly clerk left part of my things out of the bag and I had to go back the next day to collect them. In fact, driving away from the store, I called back in and asked if that was left out of my bag and he placed me on hold then came back and said no, it must be with me. The next day, I called in and spoke to the manager and she said "oh yes, it's right here." He then was a rude git again when I came to pick it up. No apologies for his mistake or even for the inconvenience I'd had due to his carelessness. I thought of complaining to his manager. I thought of writing a blog post naming names and fuming over the shoddy treatment. In fact, I was going to do that last night, but I went to bed and got a very good night of sleep after a day in which I'd gotten a lot done. It felt somehow wrong to go on griping. I have a job I enjoy very much, and my work is in the service industry, after a fashion. If I had the earning and benefits potential I really need to prepare for retirement, I would never leave this job. However, one must be realistic, and I also think my conscientiousness would make me an incredible nurse. Well, that and the fact that it's nearly impossible to gross me out, but I digress. But whatever I do, and whatever crap is going through my life personally, I check that at the door and bring my attention and energy to performing the task at hand and making sure the customers who pay my salary get the best of my efforts. I would bring that same energy if I were flipping burgers, washing dishes or running a company for a living-- I don't believe in viewing certain tasks or the people who perform them as lowly. All things need to be done, so why be surly? Take care of business. Again, I thought about writing an eviscerating post on the crap service, as I said, naming guilty parties and all that, but what would be the point? If anything were accomplished in that, it would be blowing out a candle inside a blazing building. We are living in the Snooki-verse now, and slutty/tacky/rude is the norm. Customer service certainly ain't what it used to be, and maybe the only sane course is to shrug it off and be unsurprised by execrable service and not let it ruin your day, and to be pleasantly surprised when you receive superlative service, and to make sure that good service does not go unrecognized. I've got a lot going on. I'm in school, working full-time, trying to study adequately to earn the high grades I crave, and I'm going to yoga regularly and trying to eat healthier. I have to carve out time to cuddle puppydogs and to go see my folks in Dallas. I really don't have the time to spare on a rude person being rude and giving poor service for which I paid a premium, so why does this bother me so? grades update: I just made a 100 on a Psych quiz, which makes my average 89.68. If I make a 100 on the assignment I just turned in, my average will be 90. Fingers crossed, but I've not made anything but a 100 on any of my essays thus far. 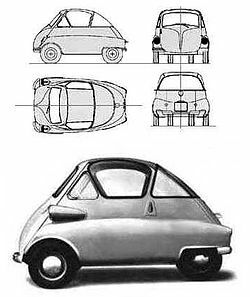 The Velam Isetta is a little bubble-shaped micro car produced after World War II. Produced in several European countires, aparently more than 150,000 of these puppies were built and holds the record as the top-selling single-cylinder car of all time. With cuteness to rival that of a bunny's nose, how could it not have been? 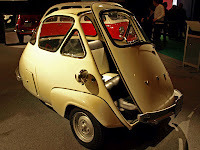 I first fell in love with this car when I saw the chic Fred Astaire and Grande Dame Kay Thompson climb out of one on their way to a beatnik party in late 50s Paris, oozing coolness. I've seen someone driving one about in England in Kent. Actually, I've seen several very kooky old cars in England, and they all filled me with delight but this one was the holy grail of kooky car sightings. It's probably not street-legal anywhere in the USA, but I'd dearly love to have one. Come to think of it, I think I saw a microcar of some stripe going to rust a couple years ago in a yard around here somewhere. This merits further investigation. Watch this space. This is a gigantic wooden coaster. Last year, they apparently spruced it up and slapped some paint on here and there. The rails are now red, but I think the forest of timbers on this coaster didn't need any embellishment. This is a scary beast of a coaster, and absolutely the roughest ride I've had on any roller coaster. Still, there's something special about the wooden ones with their network of planks and beams and supports, isn't there? I woke up Sunday morning and le Chooch was on the pillow next to me, facing me. His right lip thingie was scrunched up on the pillow. I tried to move very slowly and quietly to get the phone to snap a pic. When I pushed the button to take the picture, he opened his eye as if to say "may I help you?" This rates high in the stakes for Fatal Attraction To Cuteness. When you awaken from that diabetic coma, you'll feel so relaxed! Anyway, researchers have found that beets boosted the efficiency of the body's oxygen use for climbers in the Alps. 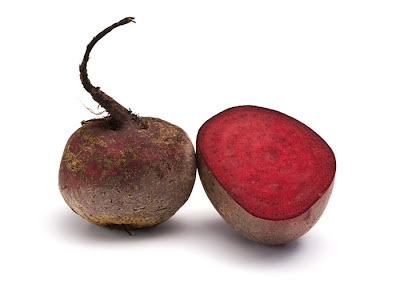 Beets also are great anti-oxidants and lower cholesterol, among other comely attributes. I love beets. I would never touch them until I tried one about 10 years ago or so and found what I'd been missing. Someone told me they think beets taste like dirt. Yeah-- good dirt! I've heard people say the same about cilantro/coriander. I can't imagine a diet bereft of cilantro-- how dull? There's something wonderful about a leaf of cilantro floating in a bowl of Madras soup. Yum. I get off work at 4PM, so when I got to the Dallas area late Thursday, it was still plenty light. Driving along, at one point, off to my right I noticed a storage facility with the corner smashed in. It looked like a giant foot had crushed the corner of the building, disgorging its contents in the process. A bunch of stuff was spilled out onto the pavement. I think maybe someone didn't know about the damage, but it seemed really odd that it wasn't at least covered up with a tarp. Then I noticed the real damage across on the left side of the highway. Rows of nice houses were festooned with blue tarps across the rooves, which mainly looked intact. A few houses were beyond tarpable. I didn't expect to see any of the tornado damage when I came here this weekend. I'm glad the reports have been of how many escaped injury even in houses that were demolished. Ultimately, stuff is just stuff, and they are making more of it. Your life and your pets can't be replaced, though. Dad is changing my oil and checking out LouLou before the trip to St Louis next week, making sure she is road-worthy. I'm getting my hair done and hopefully finding some fabulous sandals. I'm also searching for a pot of Texas Star hibiscus, Indigo Spires salvia, and a few other of my perennial favorites to try in my yard. There's one big gardening center in my area that is decent, but their selection largely tends toward annuals and perennials that are more middle of the road, whereas I cotton to more of the native perennnials that do well throughout most of Texas. It's kind of a crap-shoot, though, because I'm still figuring out what works in the soil at home, because the pH is different to the Dallas area soil I gardened in previously, and the composition is very different, too. The same things don't seem to thrive in Elsewhere, so I'm finding my way with that, and hopefully my planting scheme will be much more fleshed-out and established before the really harsh weather hits. To my delight, my Oak Leaf Hydrangea weathered the mild winter just fine, is nicely leafed-out now and several spikes of flower buds are rearing their furry little heads now, and should be in full bloom within a couple of weeks. My fennel is going bananas, and I check it frequently for the eggs of Swallowtail butterflies, but none so far. Today I'm going to try to find Bronze Fennel which they love even more than the plain green variety. My container garden is going well. It's been so mild and moist that everything is pretty much thriving. We'll see how long it lasts, but for now, it gives the porch a lot of color and cheer, and it really makes me happy. I'll post pics from at least one garden center I visit this weekend. Home again tomorrow hopefully in time to catch some friends in a play in an area theatre. I left class a about 9:30 Tuesday morning only to see wicked storms slinking off in the distance. There was a lot of rotation here and there. I didn't think about where they were going. I was thinking about my work day ahead, and my upcoming test and going to Dallas this weekend and my usual thought process that helps me make it through my too-many-irons-in-the-fire routine. So, sitting at a stop light after afternoon class session and before going to Yoga, I saw an email on my phone from a friend saying she was glad I was not in Dallas any more, considering all those tornadoes. All my close family are still in Dallas. I hope the observation of low casualties remains true. I harbor no delusions about the region where I live. Some places have earthquakes, some have volcanoes. Islands have tsunami. This place gets tornadoes. No place is perfect. I think every day how precious and how fragile life is. It is important to appreciate your life and your loved ones, and not to take for granted that you will always have them. We are not guaranteed a tomorrow that won't change our lives forever. Come to that, we are not guaranteed a tomorrow. Live today. This venison salad is what passed for an amazingly fine dinner here at chez Phlegm Sunday night. I chopped up some bacon and fried it up with a bit of butter, then seasoned with freshly cracked pepper, salt, lots of garlic and a generous helping of dried parsley. When the bacon was properly cooked and seasoning thoroughly mixed in, I tossed in the cut up backstrap. On the plates, I laid out a bed of mixed sweet salad greens, topped with a sprinkling of pepitas (pumpkin seeds) for a bit of textural variety to the bite, and then I put the buttery meaty bits on top. No dressing necessary. This was two smallish strips of backstrap from a young male deer that Dad harvested last year sometime. He said he expected it would be very good to eat. You were right, Dad! I was picking a pack of venison to thaw out of the freezer Saturday when my hand fell to the small one said "tenderloin" and I got a little giddy. I can't believe my sister let me get hold of that one before she gave up red meat. This was so delicious. We ended up killing the entire lot of salad greens, which were great with the herby garlicky drippings from the meat. Himself was practically levitating over the meal, and I have to say I was mighty pleased, as well. I'm sorry any animal had to die for my meal, but I hope I did them justice. This was my first time to cook backstrap, and I don't think I'll be tempted to cook it any other way. It's such nice meat that to do anything more elaborate would be to paint the lily, yes? Did you hear about the nurse in Texas who was sentenced to life in prison for injecting the lines of dialysis patients with bleach? She was sentenced to life in prison. I said she should be sentenced to death for that. Himself said she should be strapped into a chair and injected with bleach. I have to show this thing I did with my fingernails. Base coat here is a color called Knackered by Butter London. In the bottle, it looks decidedly green in cast, but most angles, it looks a lilac color. Also has brilliant microglitter for a super-sparkly effect in pretty much any lighting. By the way, I bought Butter's base- and top-coats and nail polish remover in a set thingie at Ulta recently. It's expensive, but is hands-down the best overall product line for manicures I've found. Best best best nail polish remover. Expensive. Worth it. The black lace effect I achieved with a black polish and image stamping plate from Konad. You paint the polish over the image you want on the image plate, squeegee off the excess and then lift the remaining design in polish with a rubber-stamp type thing. I did order the Konad black polish, which I think is formulated for this stamping style process. I love it. I tend to hate nail art, because so much of it reeks of high cheese factor, but I think this looks a lot nicer than the usual crap. Oh, and yes, my index fingernail is wonky. I had my finger smooshed in a door at school in first grade and the nail fell off and it came back in wonky. I think the bone at the end of the finger got smooshed, too, because it's kind of misshapen, but it all seems to work fine, so no biggie. Just slightly odd. Hurt like f***-all at the time, though. Keep in mind if you've chilluns around the house, Gorillaz cd comes in more and less explicit flavors so careful if you purchase. One of the coolest things about dogs is how they anticipate our behaviours and act to please us. At least mine do. The cool thing about the puppy lottery is that pretty much anyone can win, if they'll give their heart to the puppy in question. I realize not all dogs are trainable (nor are all people) but the companionship of a good dog makes life so much the sweeter. Here the puppies were being sun-bunnies in the warm afternoon sun yesterday.